With past efforts to change things at the city owned building “not going as smoothly, as easily as we wanted,” the new plan seems to heading the city in the right direction, said Alderman Judy Fiske, in whose 1st Ward the building is located…. The building, which leases space at below-market rates to artists, faces substantial repairs, including a new roof and heating and air conditioning system. City officials have looked at a new model for operating the center, a former school building, including asking tenants to take a greater role in the building’s upkeep. Clear property rights are necessary to resolve the hold up problem. Under the status quo, no part of what is designated as common territory may be so much as rearranged without consent from all communities. This often leads to the neglect of badly needed repairs when the communities cannot come to an agreement among themselves about the final shape of a project….A less grave sign of this state of affairs is located on a window ledge over the church’s entrance. Someone placed a wooden ladder there sometime before 1852, when the status quo defined both the doors and the window ledges as common ground. 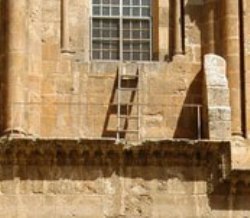 The ladder remains there to this day, in almost exactly the same position it can be seen to occupy in century-old photographs and engravings. Re: Church of the Holy Sepulchre: good grief! Why don’t they jointly hire a contractor; then, everyone has skin in the game and no one can claim property rights? I’m sure there’s some ancient text that prevents such things … oy.